Photos for Nov 28 courtesy of Cristian Tambley and Matthieu Galvez. One gem after another...We left the realm of Licancabur's emerald to enter that of Aguas Calientes' ruby exactly one week after. Where Licancabur is a mystical and sacred mountain, we were to discover that Aguas Calientes had some sort of magic to it, sometimes a little too facetious for our own taste: Porters disappeared for hours at a time and reappeared literally out of nowhere; they were inspired to make strange decisions on their own, which kept us stranded for 36 hours, radios did not work, equipment vanished and resurfaced...It was as if the mountain was telling us "you want a piece of me, then show me what you got first!". Just like Licancabur but in a very different way, that was going to be a school of patience. Our will was very much tested there too, as well as our strength. This ascent was the most difficult and strenuous climb I have ever done, an opinion shared by all my companions. 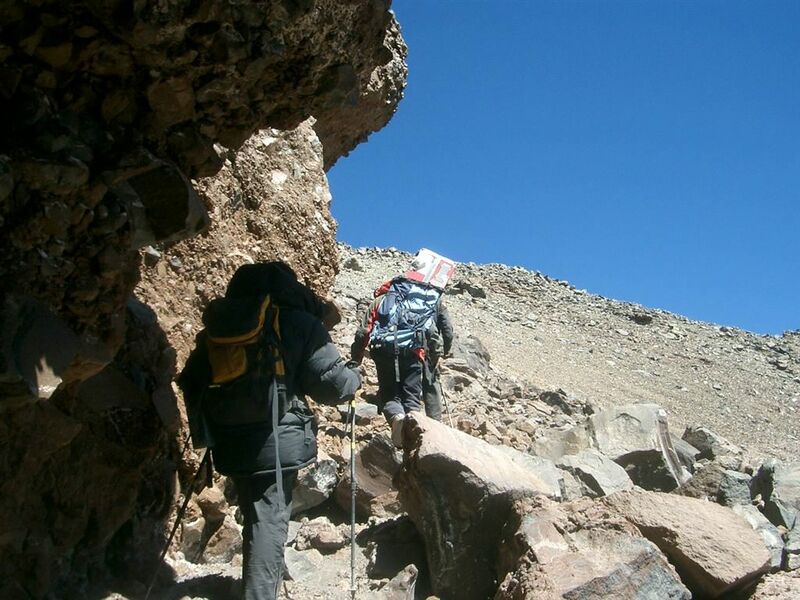 Each step was an effort against gravity, against our mind and every single muscle in our body telling us to go down, the other way, not to continue up...We did continue, though, and the spectacle at the summit was out of this world. Macario and Victor went on a reconnaissance two days before and the news were interesting. 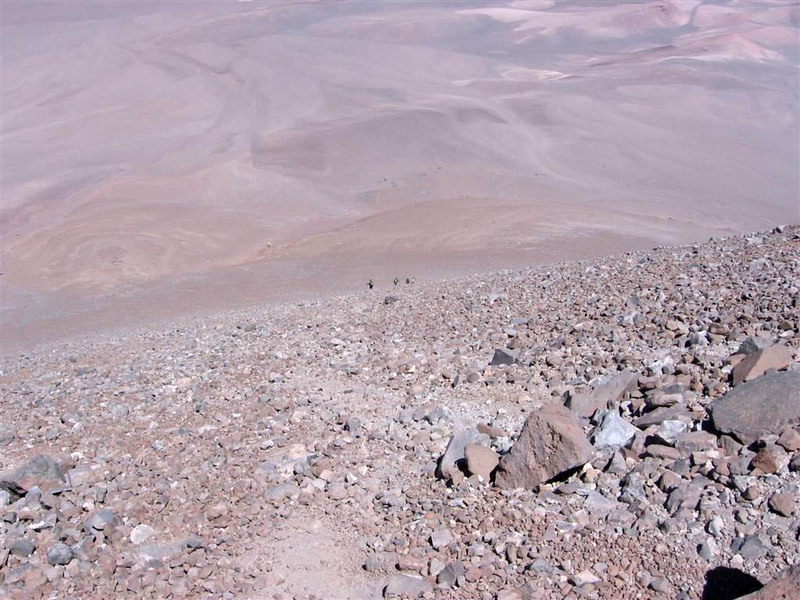 Basically, to start with, a 45 degree scree, sand and gravel slope for 500 m and the last 600 m in huge blocks. They were right... There is no trail, we will have to make it as we go...Starting at 4,800 m, we try to contour the problem by going up through a little gully. 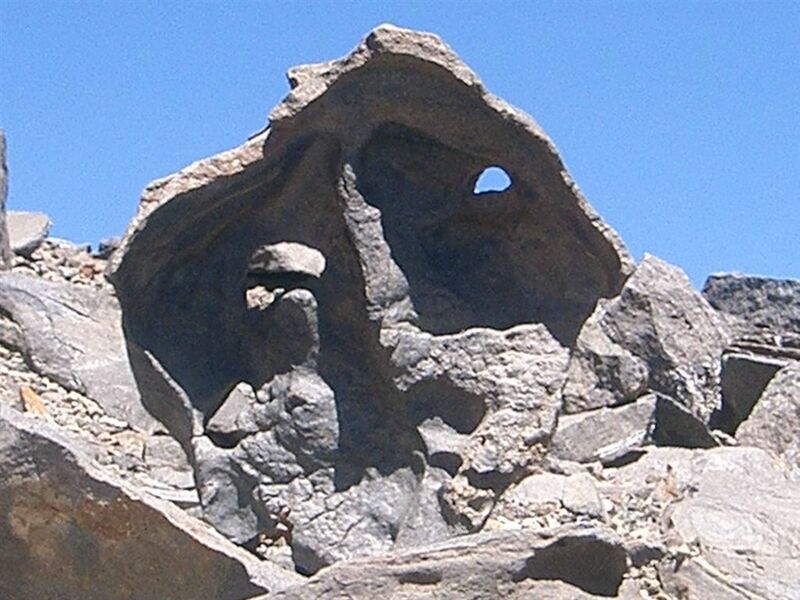 There, we encounter more rocks but, with that kind of slope, they are not necessarily stable. We have to watch every single step we take. But up we go. Macario, our guide, is with us. The three porters are in front of us. We can see two of them, Martin and Barnabe. 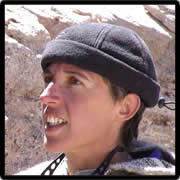 The third one, Jaime, has disappeared in thin air (literally) one hour into the ascent. We look everywhere on that slope: Nothing... We call on the radio: No response. I am starting to worry since Jaime complained a bit about some lower back pain in the past days. I hope he is not in trouble somewhere. We continue up but still look all around. Nothing. We resolve to use the whistle but the result is the same. Macario is anxious, as we are. His look gets more piercing but no, Jaime is nowhere to be seen on the slope. We are getting close to what Macario told us would be the only possible mid-camp on the mountain, maybe 30 minutes away and suddenly, we all freeze in our footsteps. Jaime reappears in front of us, maybe 150 m higher in the slope, out of nowhere. If I had been alone, I would have thought that my four weeks at altitude were starting to play tricks on my brain...but we are 6 and we all see the same thing. For now, though puzzled, we are most of all relieved to see him, apparently doing very well. 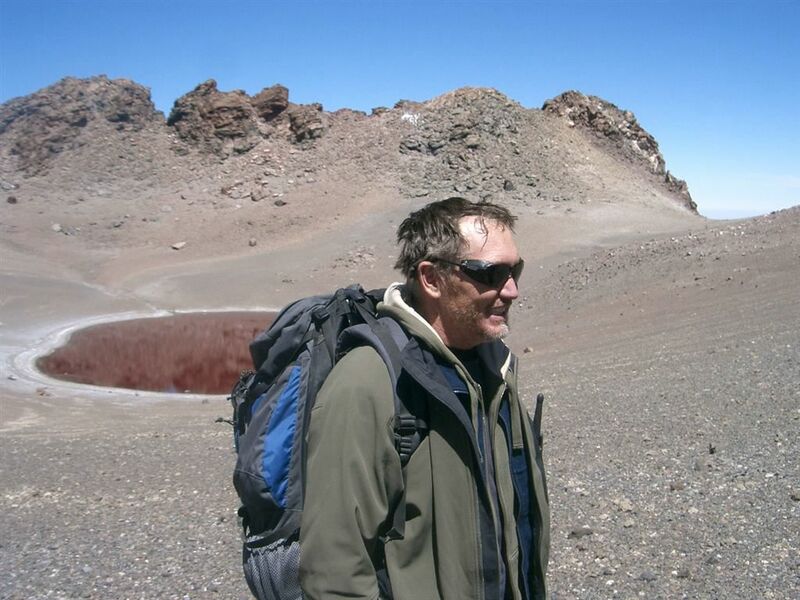 I will have a few questions for him when we arrive at camp, which happens two hours after we started our journey up, covering 500 m in elevation. 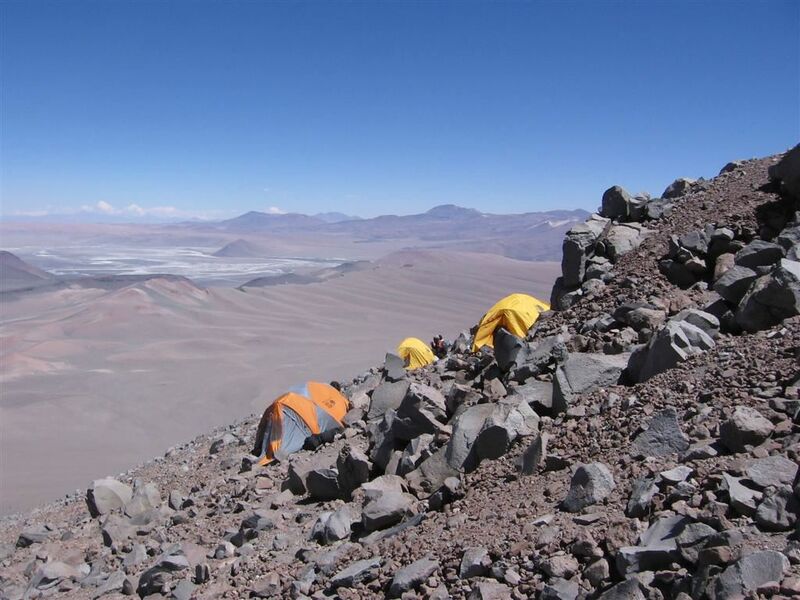 "Mid-camp" is at 5,370 m. We build our tents making sure not to fall off the terraces at every step we take. Not much room to move around. Soon the stoves are out. Cristian, Matthieu, and Victor are sharing one tent. I am sharing mine with Eric. We are the closest to the big blocks, some of them not looking so stable to me but hey, it is not that we have the choice. Just like for Lascar, I am hoping that this mound of rocks will stay together for a little while more... From the corner of my eyes, I see the porters now building their own terrace to put their tent. Jaime has explained his disappearance...He took a parallel gully to ours. 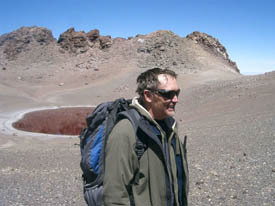 I am not too happy because first he did not tell the other porters or us, and second, he did not have a radio with him. I have two words with Macario as well because he is supposed to be in charge of these guys...At least, there is a rationale explanation for Jaime's disappearance. The day comes to an end. The view is just spectacular. The reds and yellows of sunset add to the browns of the landscape. Eric is boiling water. Soup! We dig in our bag of food. Salami, cheese, crackers, tea. That's not the Ritz but that makes us feel comfortable. Eric stays a little longer outside to take videos of this incredible landscape. I call it a day and disappear in my sleeping bag. Silence falls on the camp. The wind subsides with the advancing hours of the night. Sleep comes and goes but overall, it is a very decent night. I hear Macario and the porters leave at day break and fall asleep again. Everybody, which means the five of us remaining at camp are up around 7:00 am. The plan is the following: Breakfast, breaking camp, and waiting for the porters to come back at camp to start our ascent to the summit on this November 27. Macario has left at 5:00 am to go back to the foot of the mountain to get some more of our equipment up. We could not carry everything yesterday. The porters follow him one hour later. Everybody should be back around 9:00 am at mid-camp.Well, that's the plan...Macario is indeed back at 8:30 am. No sign of any porters at 9:00 am, 10:00 am or even noon. I ask Macario. He does not know. I am unhappy. The late hour means that our climb is out for the day. What's up with them? Martin has a radio. Why isn't he responding to our calls? I ask Macario. He thinks he left with half batteries. Now, I am fuming. For a second, I am thinking of descending and calling off this ascent. 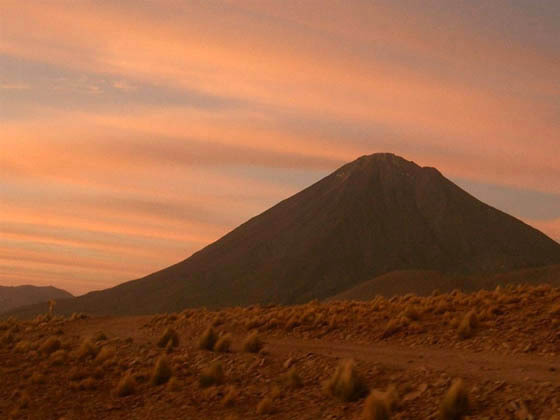 There are too many things out of control, not to mention only one car at the foot of the volcano when we should have two. At least, the second vehicle is showing up later in the morning. This is the first time I am stranded on a rock...That's an interesting feeling.I am thinking about Maxima, our cook at the refuge, and her soup; I am thinking about Edmond who was wise enough to stay there, and I am thinking of Mimi, "my" cat at the refuge (well, she adopted me). They are so present in my mind and still seem so far away right now. I am also thinking about the three porters who will be at the receiving end of my bad mood when they show up again. Macario is desperately calling on the radio but still without response. It is around 1:00 pm. I am back in the tent for a moment, just resting and gathering strength for tomorrow's climb. I am also regretting not to have taken my book with me but the landscape surrounding us that I can see through my open tent is enough to keep my imagination going...And then Macario's voice resonates in my radio always open and suspended in my tent, right next to me. He sees the porters. 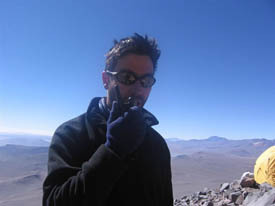 I am out of the tent in no time, jump off the terrace and reach him and Cristian on the slope. They are both looking up. I can't believe that...The three porters just showed up below the lava cliff. They are 40 minutes away from the summit and going up...Macario is frantic on the radio but to no avail. Their radio might be off or if it is on, maybe they are out of batteries but they are not responding. Well, at least, now we know where they are. Once they don't see us in the crater, I assume they will leave the equipment there and descend to mid-camp. That would be the logical thing to do but at this stage, I am not sure that there are any logics left anywhere in this ascent. This is why I ask Macario to keep looking up and when he sees the porters going down, to find a way to catch their attention somehow. 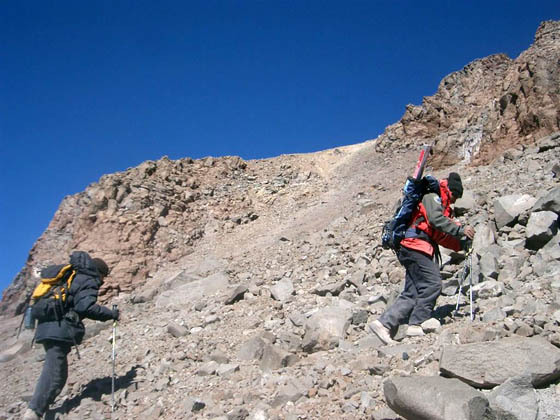 This will happen at 3:00 pm, when they resurface from the summit crater...Getting their attention will be done the old fashion, by yelling our lungs off...They see us and start descending directly toward mid-camp. Boy, am I waiting for these guys...The worry, the day lost, and possibly an ascent over if the weather or anything else does not cooperate tomorrow. Thinking about the next day, the fact that most of our equipment is already at the summit might actually play in our favor. 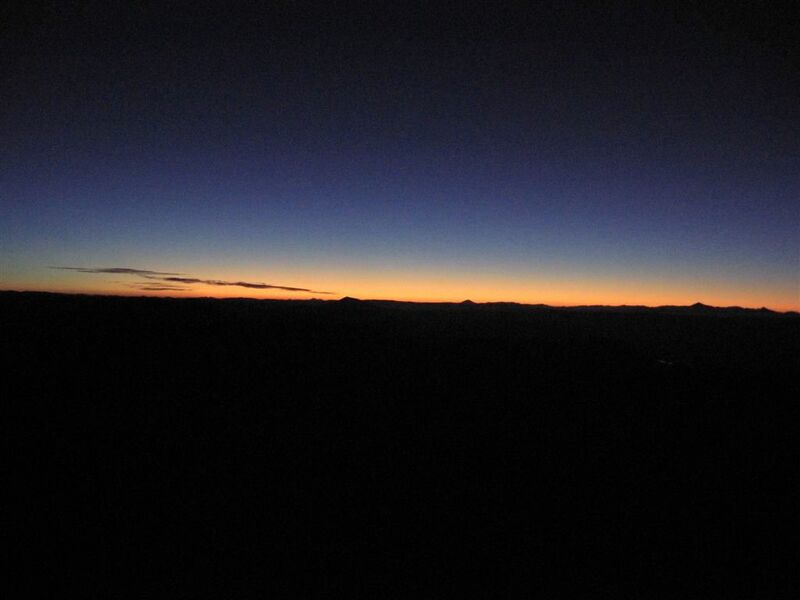 We will be light tomorrow to go up.The porters are back with us at the camp. 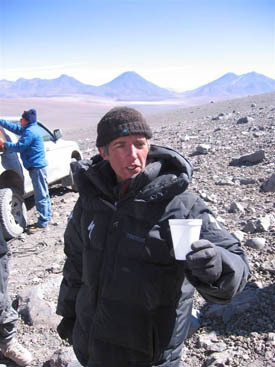 We have a little chat...Macario is also unhappy because he had told them to come to the camp, not to go to the summit. What got to them, we will never know but they are here, and this is what counts. Macario gets some of the lecture too because as their boss, he is also responsible. Anyway, a few hours later, everybody is laughing again with each other and we are thinking about tomorrow. We keep busy the rest of the day by responding to Eric's video interview and then, early dinner. The temperature is cooler today and we must get up really early tomorrow if we want to make it happen. This will be a departure at 7:30 am. Macario is predicting a 5-hour climb in the steep slope and loose terrain, which means an arrival a little after noon. We have two hours to do everything at the summit, or at least what we can. We have prioritized our tasks and will go down the list. We all know what we must do up there and we should be able to make it happen. We are surprisingly fast (relatively) in that type of terrain. Two hours after our departure we leave the scree and ash to arrive at the base of the 100-m high lava cliff, some sort of a volcanic fortress that we still need to overcome to get to the summit. When I ask Macario how much more time the climb will take, he responds "one hour". If this is the case, we will have been climbing in hellish material much faster than expected. That would put us at the summit in 3 hours instead of the 5 planned. Matthieu, using a very typical expression in French slang compares us to "mules". Well, although we were going to do great on that ascent, it will finally take us one more hour and half to reach the summit. While Macario told us that the ascent would be easier in the rocky blocks, he forgot one detail...We would have to literally climb some of them to pass. It never ends...One block after another. 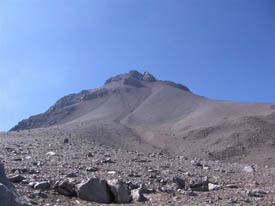 The summit is now visible and seems so close but no, it is still far. We cannot just make a B-line. This is impossible in this type of terrain. We have to find our route, climb, contour blocks, make switchbacks, and best of all, contour the base of the cliff, with overhanging fractured blocks just over our heads.This is tough, physically really tough, tougher than anything I have ever done before but strangely, as the mountain keeps challenging us physically, it is finally giving something back: Our mental strength is now of steel. I do not know where we get it, but our energy is so intense. While we should be exhausted, we get more overjoyed by every step we now take. We can see the summit, we can almost touch it. Macario continues to pave the way for us, finding an invisible path in the middle of the rocky chaos of these last 100 meters. A last switchback passing underneath the overhanging rocks; a tiny and frozen cascade to our left and to our right, the summit rim. Am I dreaming? No, this time it's here, really here. 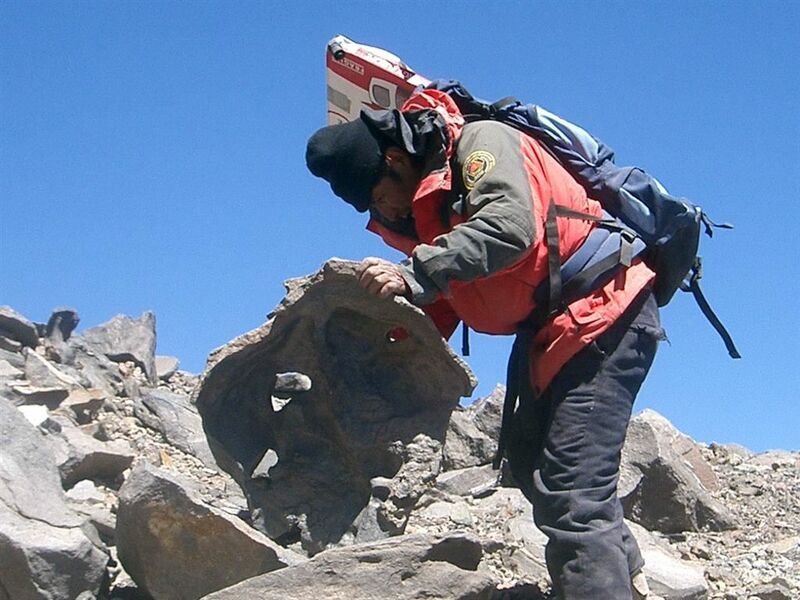 Before crossing the edge, Macario finds a tortured hollow lava block that looks very much like an Inca mask. He takes it and puts it upright. 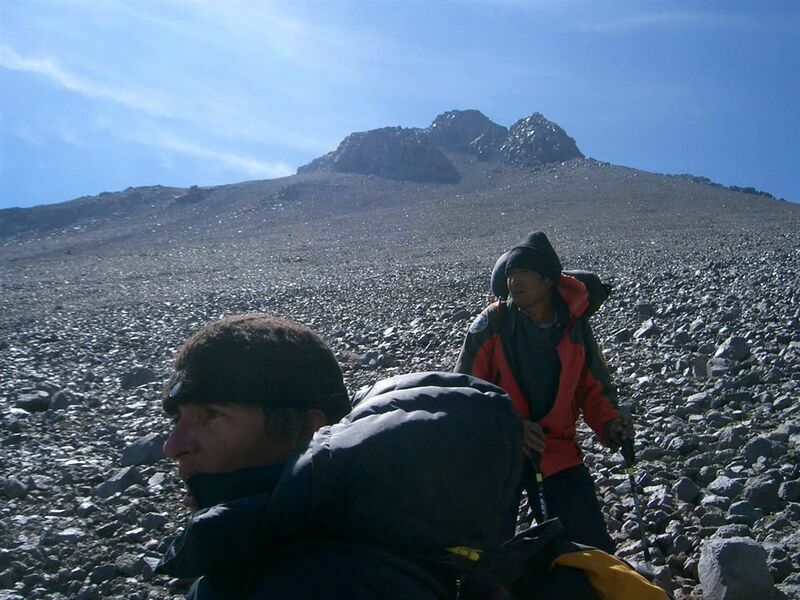 Somehow,I have the feeling that by doing this, Macario is materializing the spirit that seemed to have accompanied and tested us in the ascent, and possibly in the challenges of the previous two days. This is very appropriate...Now, the gate of the Aguas Calientes summit will be guarded by this mask. We move on...Speaking of energy, Eric must be on 220 V. He passes me almost running with his camera on his hand. He wants to film our arrival at the summit. What can I say...I am just smiling, happy like the rest of the guys. Wow, what did it take from us to make it up here today...Best of all: We made it in 3 hours and half instead of 5. That's an additional hour and half for science. 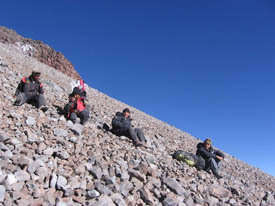 Everybody is on the summit rim now, inside the crater. I cannot help it, I take a few steps forward. I want to see that lake. I hope it is worth all what we left on the slope. Worth? I am speechless. In front of my eyes, another crown jewel unravels, a magnificent ruby, a gem in the heart of an unlikely jewel box. 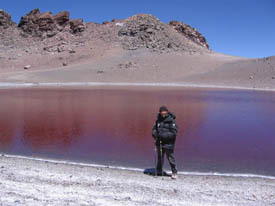 What a beauty...The lake is so red that depending on the angles we look at it, it turns sometimes purple. Still, after all we went through to get here, I have a "niak" moment, tighting my fingers into a fist. It was a battle to get up there, a fortress to conquer, but the mountain once again rewarded our effort. A jewel to discover, to explore, a magnificent jewel now offered to us. Of course, photos...Banners are out, smiles are on all faces. 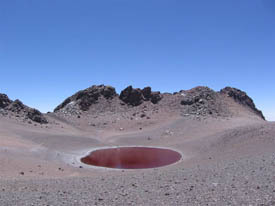 It is now time to get into the crater and to the shores of this lake. Let's get acquainted. But before, I am taking a GPS measurement of the altitude. 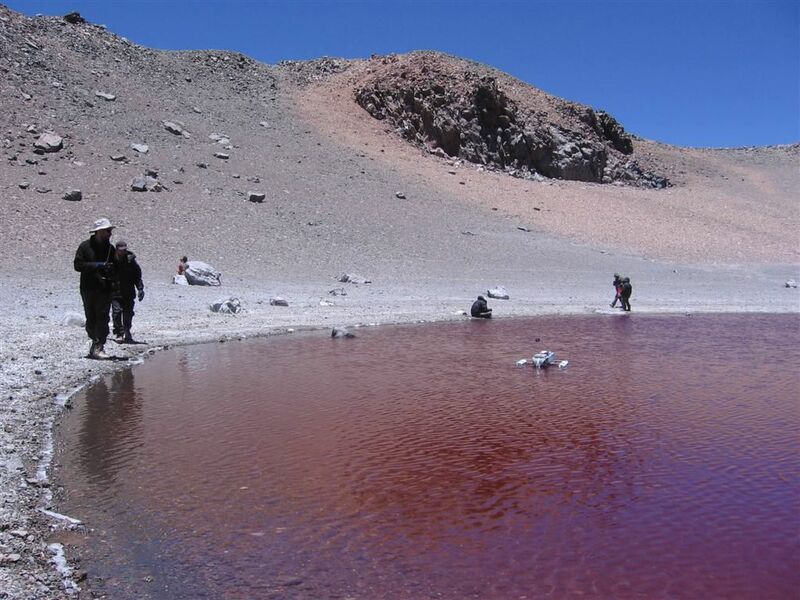 Including the lava cliff, Aguas Calientes towers at 5,930 m. The lake is at 5,870 m.
The red lake is about the size of that of Licancabur but rounder, almost looking like a red balloon. Its shores are circled by white deposits and the signs of a few ancient shorelines that are still marked on the ground. We all take some drink and food, much needed after such an effort and then we go to work. Matthieu disappears with Macario and Martin. They carry the Eldonet station. 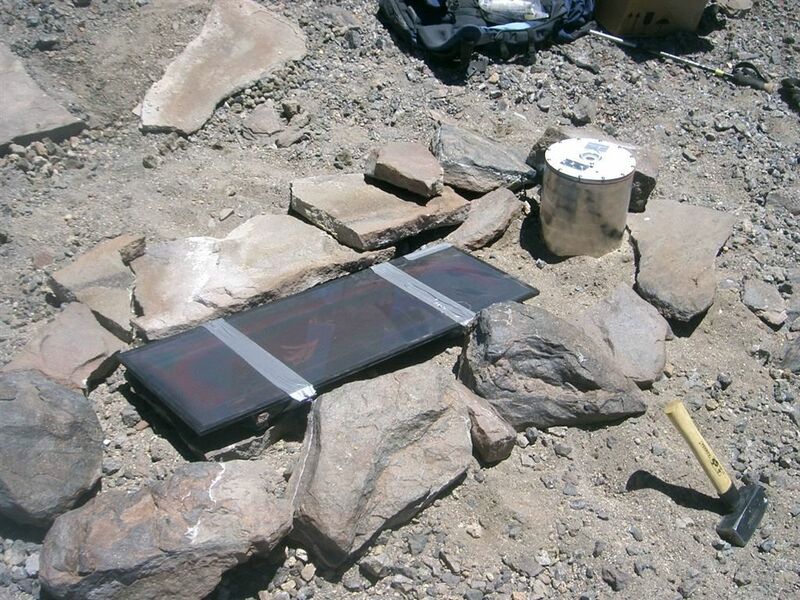 They will install it in a protected area. I take my poles and start walking around the lake, a first survey to see what is interesting and would be worth coming back to in a moment. 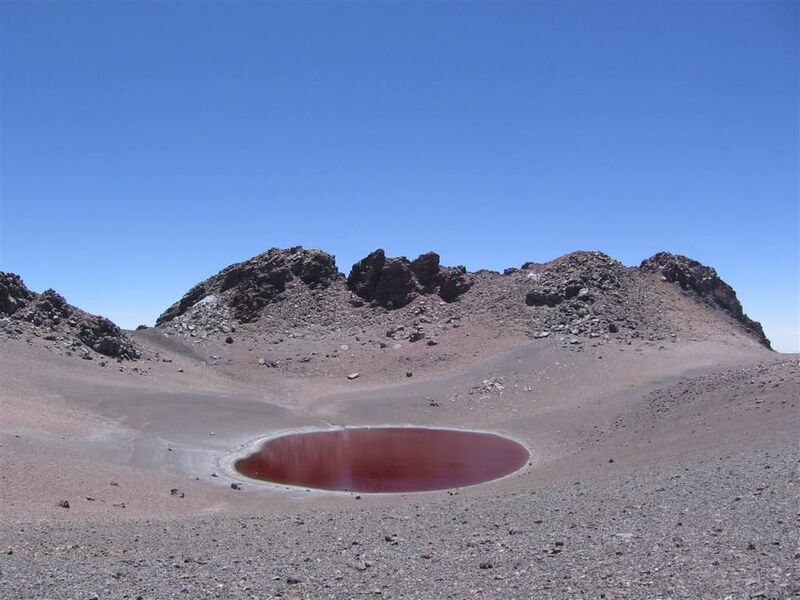 Right away, some details are striking me: There is no life visible to the naked eye, conversely to Licancabur; There is no green algae, no algae at all for that matter. I continue. There is a small channel coming down from the rim. There is a little bit of ice still in it. I suppose that it is created seasonally by snow melt. That will be a place to come back to, especially the site where it connects with the lake. Cristian and Victor are assembling the boat for the bathymetry. They are on the shore; Eric is on the opposite side, filming. It is close to noon. I go to my UV sensors and thermometer to make a few measurements. The feeling of cold was not just a feeling. The temperature is below zero.There is a little bit of wind, depending on where we are in the crater.The UV point measurements will bring one of the biggest surprises of the ascent later during the day. The counts are off the chart compared to the measurements we made in Laguna Verde, Licancabur (although higher) and Escalante. 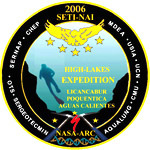 Since Aguas Calientes is lower than Licancabur, topography might play a role. The crater is wider, more open. Who knows? Some of the results are stunning. I will share them soon with my colleagues. 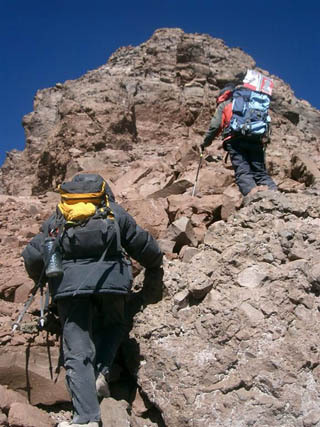 Eric and Macario have left us to climb back to the summit rim but on the opposite side from our entry point. They want to check if they can see Lascar smoking from there...Since Lascar is 5,600 m high and we are 300 m higher, it should be a nice view from above. The resulting video will be spectacular, although the opening between the lava cliffs was somewhat small to really see the smoke. The sounds coming from the shore are not very encouraging...Apparently, Cristian and Victor have some trouble with the bathymetry boat. 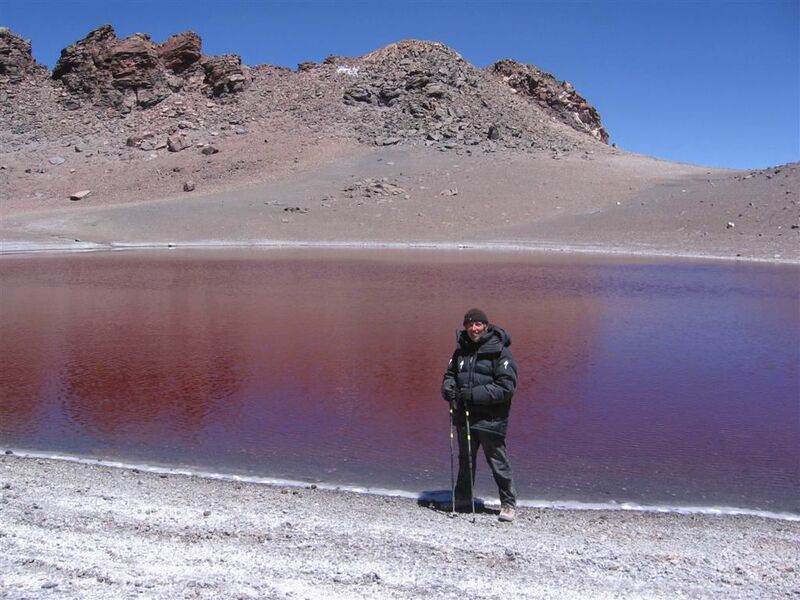 We had to switch to our back-up unit just before leaving the refuge because of a bad motor on the main unit we used to map Licancabur's lake. The other boat is a different design. 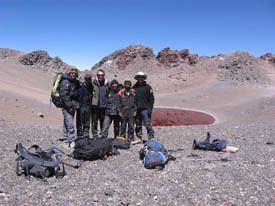 Victor, Clay, and Cristian installed the GPS, sonar, and thermal mapper on it at the refuge and tested it...in Laguna Blanca. Everything seemed fine there. The problem is that the lake in Aguas Calientes is apparently fresh water whereas Laguna Blanca is significantly salty. Cristian and Victor are now dealing with not only a weak remote but also a boat taking water, slightly sinking. There is nothing we can do, except maybe smile as far as I am concerned...We almost did not make it up to here so this is not the probable highest altitude sinking of a boat that is going to change my mood today! They finally give up. We won't know the depth of the lake this year. That will have to wait. They pack the wet unit. In the meantime, Matthieu is completing his limnological work. By 2:00 pm we are done with the science, as we had planned. I am taking another reading for the UV, which still refuses to go down...Then we pack, clean our equipment, and by 2:30 pm we are back on the summit rim, ready to start our descent after a few last photos. We are on for another good one of the day right there. It is absolutely out of the question to descend by the same route we came. No, instead we will take the central gully, as we do on Licancabur. There is a slight difference though...To see the floor of the gully from the rim, we have to really look down at our feet. The slope is so steep, it looks almost vertical...Macario goes ahead. The good news is that the material is pure sand and scree...The bad news is that this is nothing to hold a slope in place, especially with that kind of gradient. As a result, for almost every step we take, half the volcano comes down with us. Still, descending in this type of material is comfortable. We have to be careful about possible rocks hiding underneath the sand as they can make us trip. We descend fast. I am behind Macario and Matthieu is behind me. Eric, Cristian, Victor and Martin are a little behind but together. 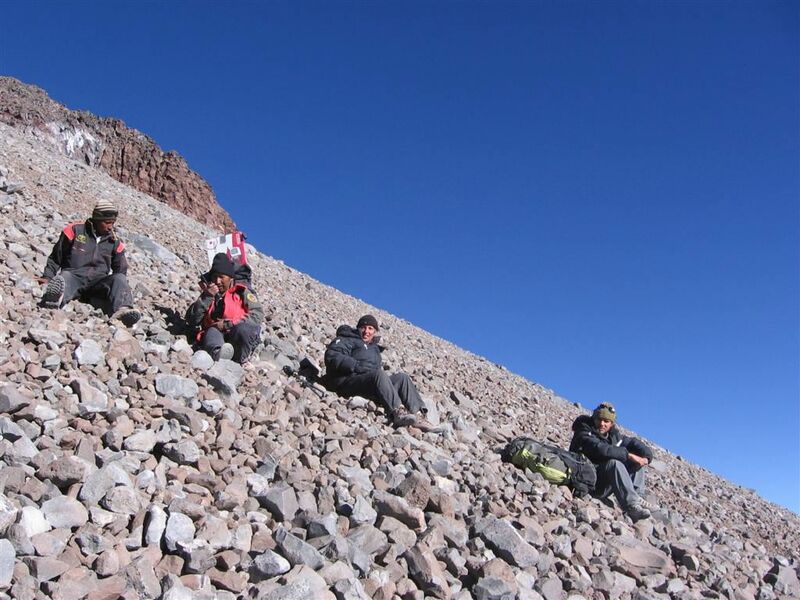 In one hour, the first three of us make it back to mid-camp, now empty, since the two other porters, Jaime and Barnabe who stayed behind broke camp and descended with all the equipment this morning.We sit there about 10 minutes. The second group is sitting a little higher in the slope but we can see them clearly and can communicate with them by radio. We resume our descent. We just have to be careful now because of fatigue, otherwise the terrain is much better going in that direction. Macario, Matthieu and myself reach the 4x4s where the drivers and two porters are waiting for us in one hour and forty minutes. Cristian, Eric, Victor and Martin will make it in two hours. What a day...Climbing 600 m from mid-camp to the summit rim in a little over 3 hours, accomplish all the science we could, and descend 1,100 m in two hours... We look back at Aguas Calientes with a lot of respect, with also a very deep feeling that the mountain is giving some back to us. The return to the refuge will be long, very long...We need to go through San Pedro to get to our bus, transfer the equipment, get through the Chilean customs and then up in the altiplano, once more but this time, we are going..."home". The journey ends the same way it started. After one of our 4x4s on the way up to Aguas Calientes, this is now the bus which is overheating. 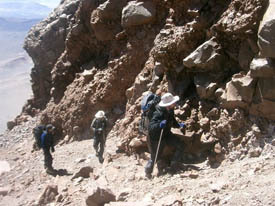 We climb at about 5-10 km/hr. If I was not so tired, I would jump and continue on foot! The sun is setting on Licancabur and Juriques as we pass by them. 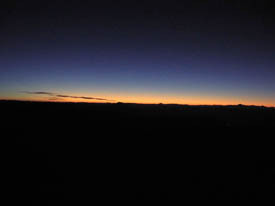 The night has fallen when we reach the Bolivian customs. We have to wake up the custom officer...As we proceed with the bus after the stamping of our passports, we discover an impressive display of light...In fact, this is lighting, not in Argentina this time, but much closer, just on the other side of the volcanoes surrounding the refuge. The altiplanic "winter" is getting closer every day. It is time to think of going home, on the other side of the Earth...In the meantime, tonight home will be the refuge, Maxima waiting for us with a great meal, Edmond and Mimi at the door. Yes, somehow, this is home. We are back. The coming days will see us packing for good, preparing our return to the US. In the meantime, in the warmth of the refuge dining room, with a good yareta fire, a soup in my plate, my husband to my left, my team around me, and "my" cat on my lap (she feels like I am her "human"), this feels really like home. Mimi will follow me in my sleeping bag and will not leave my side the entire night. As I am finishing this account from San Pedro today, December 2, I am thinking of her. Mimi...She has her mom there to hunt at night and to play during the day. She is also a survivor, she proved it. She slept with me the last night spent at the refuge. In the morning, when I got out of bed, she stood next to me, "miai" something to my ear and disappeared. I could not find her to say good-bye but she already had told me good-bye... I just asked her to be there next year when I come back. 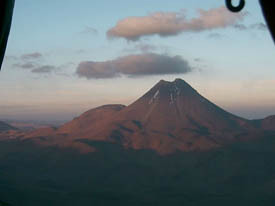 She is so much part of the little family of the refuge, this tiny building hidden between towering volcanoes. I am going back home...I am leaving home...This is confusing. There is certainly a part of me back up there, made of team work, joy, physical challenges, science, and plain frienship of the little world of the refuge which has become mine throughout the years. It is tough to leave, leaving behind emerald and ruby, wonderful people whose only riches are their heart that they give you entirely, living a kitten behind. We live an Equator apart but the link is never broken, that invisible link that connects hearts and soul. So long, Mimi. Move mouse over image for team member's name (For Internet Explorer click on form field first). Click on image for biography.